You can never have enough chocolate recipes, right? 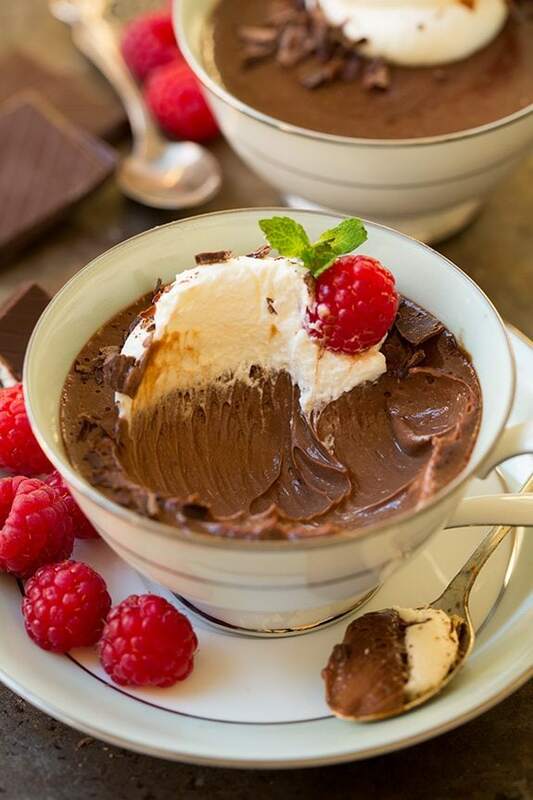 Especially the rich and creamy, utterly enticing kind that have you savoring each and every last bite, which is exactly what you’ll find with these Chocolate Pots de Creme! They’re easier to make than you’d think and sure to impress. You will want to lick the dessert cup clean, as in all of them…or just steal a few bites from the person sitting next to you when they aren’t looking – that’s what I like to do. 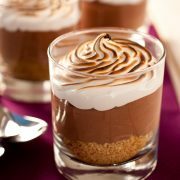 I could sit here and rave about these irresistible chocolate dessert cups all day but really you just need to try them for yourself. 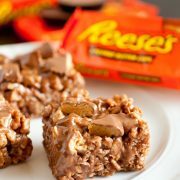 They are actually really easy to make, there isn’t anything challenging about this recipe. The only important thing is that you don’t scramble the eggs in the custard mixture, in other words be sure to stir constantly while scraping the bottom and sides of the pan and don’t boil the mixture – just almost boil it. Easy enough right? It’s just like making an ice cream mixture that includes egg yolks, if you’ve ever done that before you’ll know exactly what to do here. 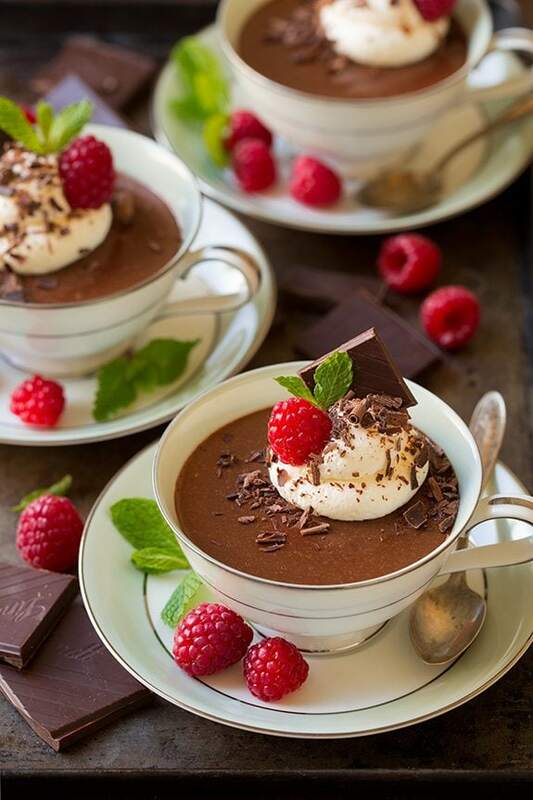 These are the perfect dessert to serve at just about anything or just to make to treat yourself, because we all need some decadent chocolate indulgence in our lives on (frequent) occasion! And you can serve them like I did here in some fine China tea cups. These were passed down from your Grandma, I’ll always love them! This dessert is totally worthy of getting out your nice dinnerware. I know I’ll be making these again and again, espeically when my mom is around she is crazy about chocolate. But aren’t we all? 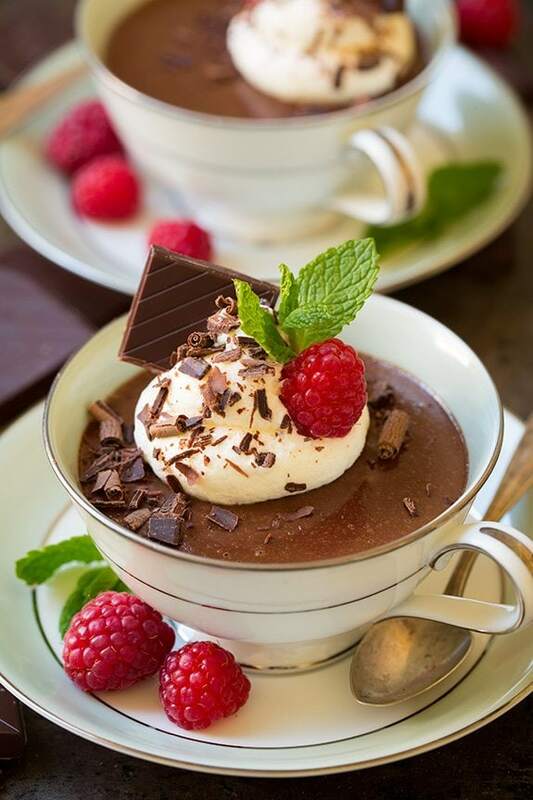 If you’ve never had Chocolate Pots de Creme before they are similar to a mousse but their texture is denser, and they’ll also remind you of a rich homemade chocolate pudding but with a thicker consistency. If you are wondering what to do with the leftover egg whites, make an Vanilla Bean Angel Food Cake. It’s another oh so delicious dessert that will have everyone raving! 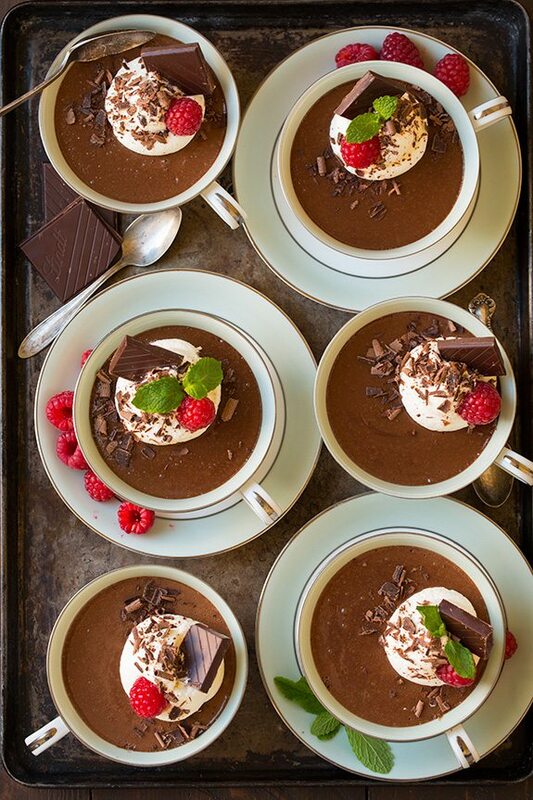 Rich, creamy and utterly blissful chocolate pots de creme! Easier to make than you'd think and sure to impress. Perfect for any occasion. For the Pots de Crème: Place chocolate in a blender, set aside. Add heavy cream, milk, sugar, egg yolks and salt to a medium saucepan and whisk until well combined. Set saucepan over medium heat and cooking, stirring constantly with a spatula while scraping along bottom and sides of pan, until mixture has thickened slightly and nearly boils, about 6 - 9 minutes (mixture should coat the back of a wooden spoon). Remove from heat and immediately stir in vanilla then pour mixture through a fine mesh strainer into the blender (over the top of the chopped chocolate). Let rest 2 minutes to allow chocolate some time to melt. Then cover blender with lid and hold a thick kitchen towel over lid, blend mixture on low speed until well combined. Gently tap blender against counter several times just to remove large air bubbles (you don't want to get rid of all of the bubbles just some of the big ones). 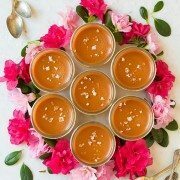 Divide mixture among 6 - 8 small dessert cups or ramekins and refrigerate until set, about 2 - 3 hours. Top with whipped topping and shaved chocolate, nuts and fresh raspberries if desired. For the whipped topping: In a medium mixing bowl whip heavy cream until soft peaks form then add sugar and whip until stiff peaks form. *1% or 2% milk can be used as well. Just add replace 2 Tbsp of it with heavy cream.